Bob Barboza is selecting instruments for the “Occupy Mars Band Concert” in the USA. He went to the NAMM Show in southern California to talk with musicians and instrument designers from around the world. Some of the musicians will appear as soloists for Bob’s new visual jazz opera on the topics of Mars and are we alone in the universe. We continue to search for original compositions and writers on the topics of deep space and Mars. For more information contact Suprschool@aol.com. Our application is open! High school seniors, apply here. The Coca-Cola Scholars Foundation supports more than 1,400 exceptional college students each year, with annual scholarships of $3.55 million awarded through 3 nationally recognized programs. The Coca-Cola Scholars Program scholarship is an achievement-based scholarship awarded to graduating high school seniors. Students are recognized for their capacity to lead and serve, as well as their commitment to making a significant impact on their schools and communities. With the 30th class in 2018, the Foundation has provided over 6,000 Coca-Cola Scholars with more than $66 million in educational support. 150 Coca-Cola Scholars are selected each year to receive this $20,000 scholarship. The application is open! Students who will be graduating in the 2018-2019 academic school year may apply here through Wednesday, October 31, 2018, at 5:00 p.m. Eastern. Please click the box below for our eligibility requirements. What does it mean to be a Coca-Cola Scholar? Meet recipient Bridget Galaty at right. From arts education to transgender rights, Bridget enlightens viewers with her documentaries. The 2018-2019 application has been revamped for this year’s cycle to make the user experience easier and more efficient. We hope this new format will allow more applicants to complete the application and give the Foundation a better understanding of their high school success. High school seniors may apply here through Wednesday, October 31, 2018, at 5:00 p.m. Eastern. A high school transcript – There is no need to upload, email, mail, fax, or submit in any other fashion, a copy of your transcript. While completing the application, you will be asked to type in your specific grades since your freshman year and their course levels. Having your transcript nearby will help you fill in this information. Contact info – The names, email addresses and phone numbers of your guidance counselor and principal. Ready to begin your application? Start here! We look forward to learning more about you. 50 Bronze Scholars are awarded $1,000. Get application details at www.ptk.org. Coca-Cola Leaders of Promise is Phi Theta Kappa’s first scholarship program available to its members to be used during the time they are enrolled in community colleges. 200 scholarships of $1,000 each will be awarded based on applications submitted by members. The Coca-Cola Scholars Foundation is committed to aiding as many students as we can. However, due to the large number of applications and our limited resources, we are able to award only a small percentage of students scholarships. To aid in the quest for financial aid, we’re happy to share the following list of scholarship resources. Please note the deadlines and eligibility requirements found at each site. We wish all students the best as they endeavor to continue their educations. FinAid – Links to scholarships, grants, loans, and graduate aid. StudentAid.gov – Information from the U.S. Department of Education on preparing for and funding education beyond high school. College Affordability Guide – This site’s mission is to provide clear, correct info and advice on the many options students have to reduce the cost of their degree, and to offer a fresh analysis of which colleges are doing the most to make high-quality education affordable. The Scholarship Workshop – Scholarship information from an award-winning author and scholarship winner. The Scholarship Academy – Offers curriculum to help students identify tailored scholarship options and build solid scholarship profile. Scholar Snapp – A free, simple to use data standard that allows students to reuse their application information – including contact information, essays, transcripts, etc. – from one scholarship application to another thereby streamlining the college scholarship application process. Peerlift – Proven scholarships, internships, summer programs, and more gathered by fellow students like you. (Founded by a team of 2017 Coca-Cola Scholars!) Learn more about the creation of Peerlift. Fastweb – Create a profile and let fastweb do the research on scholarships, internships colleges and more for you. CashCourse – Information that helps college students stay financially informed. Common Knowledge Scholarship Foundation – Educational and scholarship opportunities for students of all levels. Cappex – A free website where you can learn which colleges want you, before you apply and learn about more than $11 billion in merit aid scholarships. Scholarships.com– A free college scholarship search and financial aid information. Scholarship America – Provides information and resources for your scholarship search. KnowHow2GO – Complete information on college prep, whether in middle school or seniors. HS Finder (Hispanic Scholarship Fund) – Scholarship information for Latino students. Thurgood Marshall College Fund – Provides scholarships, programmatic and capacity building support to the 47 public Historically Black Colleges and Universities (HBCUs). Gates Millennium Scholars – Provides outstanding low income African American, American Indian/Alaska Native, Asian Pacific Islander American, and Hispanic American students with an opportunity to complete an undergraduate college education in any discipline they choose. Asian & Pacific Islander American Scholarship Fund – The nation’s largest non-profit organization devoted to providing college scholarships for Asian Americans and Pacific Islanders (AAPI). American Indian College Fund – Provides Native American students with scholarships and financial support for the nation’s 33 accredited tribal colleges and universities. Dell Scholars Program – Recognizes academic potential and determination in students that have a definite need for financial assistance. UNCF – Awards 10,000 students each year through 400 scholarship and internship programs so that students from low- and moderate-income families can afford college tuition, books and room and board. Chegg – A place to connect with scholarships and learn about colleges. Reagan Foundation Scholarships – Scholarship opportunities for outstanding student leaders. Kids Talk Radio speaks with Laurent Bernadac about using 3D printed violins in the Occupy Mars Band. 3Dvarius made an impression at last year’s NAMM Show with the introduction of its 3D-printed electric violin. Now the innovative instrument maker is back at the 2018 show with three brand new models. The Line is inspired by the original 3Dvarius design. Unlike the original plastic violin, the Line has been simplified for a perfect adaptation to its new material: wood. Its body is composed of these two woods (beech and sipo) organised in parallel lines, and oriented in the exact direction of the sound-waves running through the instrument when played. It uses the firm’s “S Pickup” to deliver a clear sound. The pre-order price starts at €999. The Equinox is made of a mixture of 3D-printed resin, wood and aluminium. Like the 3Dvarius, its central wood body is created in one single piece. This ensures a perfect accuracy of the audio spectrum and allows for smooth, optimal sound-wave flow throughout the instrument. It is equipped with a “X Piezoelectric Pickup” to deliver a powerful sound and prevent feedback. The pre-oder price starts at €2,249. Last but not least, the company has introduced a 5-string version of its popular original 4-string 3Dvarius violin. Created in partnership with a number of violinists in order to select the best lengths, heights and spaces for its neck, pickup and strings, the 5-string model is designed to give players to chance to expand their playing range and explore new styles of music and tone. The 5-string model is available now with a price tag of €7,499. The electric guitar wasn’t invented until 1931. But since then, it has become the most important instrument in modern music. Ever wonder which strange new instruments being designed today will come to define the future of music? The annual Margaret Guthman Musical Instrument Competition, sponsored by Georgia Tech, awards $10,000 in prizes to the creators of the world’s most inventive instruments. It’s a little like a wearable theremin: a “data glove” that lets the wearer create electronic music with hand gestures. A hybrid dulcimer and sitar, designed specifically to accompany devotional yogic chanting. Matthew Steinke’s MIDI-controlled acoustic organ mimics the power of a cathedral’s massive pipe organ. The Holophone projects a hovering three-dimensional shape that morphs according to vocal and audio inputs. Most sponges only make squelching sounds, but The Sponge is equipped with sensors that detect when it’s squeezed, touched, or shaken; input which wirelessly translates to sound. Check out the complete list of 20 nominees over at The Creators Project. Bob Barboza is leading a team of creative music for a special concert integrating the visual and performing arts. A futuristic, 3D-printed violin is making its musical debut next month during the New York City 3D Print Week. The sound it creates promises to be unearthly — instead of the traditional vibrating strings of an acoustic violin, this instrument is piezoelectric, which means applied pressure is converted directly into an electric signal. This electric signal is then amplified and converted into sound through a speaker. The violin is a prototype created by MONAD Studio, an architecture and design practice headed by Eric Goldemberg and Veronica Zalcberg, in collaboration with musician Scott Hall. As a violinist and a physicist, I was curious to find out more about how the instrument worked. The studio website doesn’t provide many technical details, so I did a bit more research on how piezoelectric sound works. Some materials, such as quartz crystals and certain ceramics, are naturally piezoelectric. This means that when the material undergoes some sort of stress or pressure, the atoms in the material lattice slightly rearrange themselves, resulting in an excess charge accumulating in opposite areas of the material. Any separation of electric charge creates a voltage that can form part of an electric circuit, and suddenly you have a basic electric pressure sensor. The opposite also works. Send a current through a piezoelectric material and the material will “squeeze itself”, vibrating its atomic crystal structure in response to the current. The piezoelectric effect was first discovered in 1880 by Pierre Curie (husband of Marie Curie) and his brother, Jacques Curie, and is used today in everything from scanning probe microscopes to the ignition sources of propane barbecues and cigarette lighters (finger pressure causes an electric arc which ignites the fuel). Piezoelectricity is also used in sensitive sound detectors, since any vibrations of a piezoelectric material can be translated into an electric sound. That brings us to violins. Many acoustic musicians already use piezoelectric pickups, small “microphones” that are mounted to the bridge of a violin in order to transform the vibrations of the violin into an electric sound for further amplification or transformation. The work of MONAD Studio takes this a step further. Their two-string violin seems to operate solely by the piezoelectric effect. 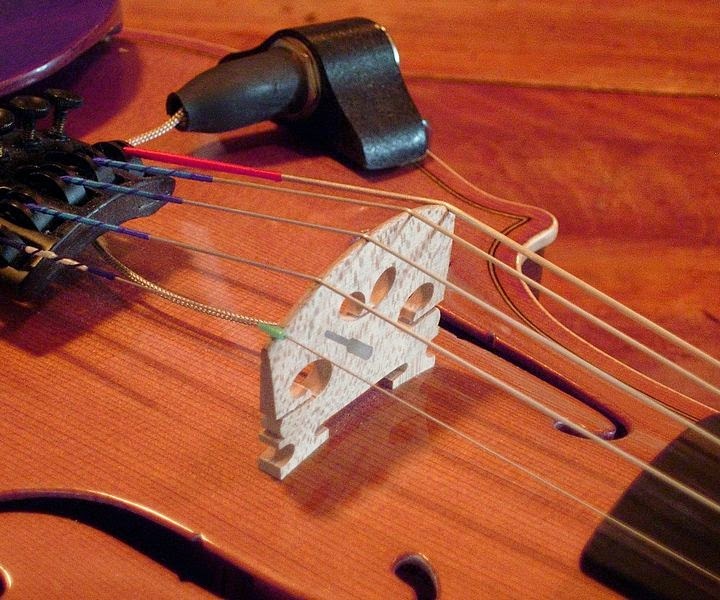 While there are no videos released of their violin in action (live performances will be debuted at the 3D Print show next month), it’s possible to imagine the musician pressing their fingers and the bow on specific, piezoelectric areas of the violin, which would send a current through an amplifier and speaker to create music. The sound is likely to be much more electric than a traditional violin. Here’s a video of a previous sound installation that MONAD Studio created for a Florida gallery in 2014. ABYECTO Sonic Environment by MONAD Studio from Eric Goldemberg on Vimeo. 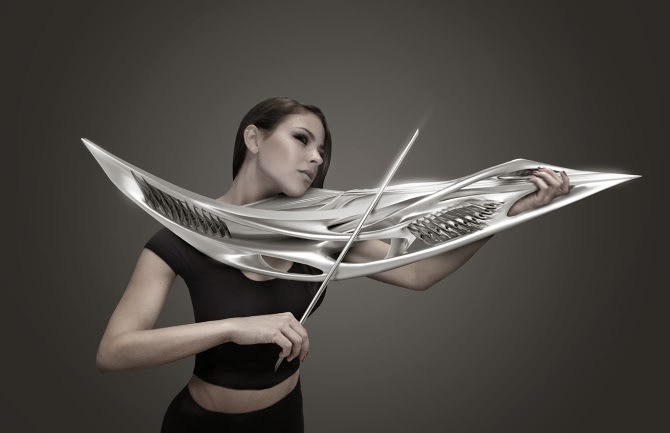 Since this violin is 3D-printed and easily customizable, the creators predict many more instruments to come. 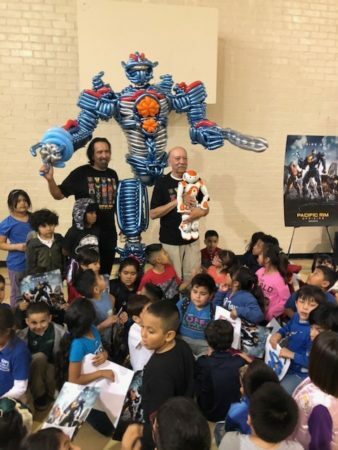 “We are now flooded with amazing proposals to collaborate with other musicians who … want us to develop a special instrument tailored to their sound and performance type,” said Goldemberg in an interview with 3Dprint.com. At the New York exhibit, the piezoelectric violin will be debuted with four other instruments, a cello, a small and large didgeridoo, and a monobarasitar (a version of the lute-like sitar instrument). These will be mounted as part of a large overarching display frame that will also make music. Goldemberg describes the entire ensemble as a “a complex meta-instrument in the tradition of the one-man band”. If you happen to be in the New York area during April 16-17, you can get free tickets for the 3D Print Week here. And send us photos! We are looking to work with musicians, artists and composers. We are performing jazz, classical and World music for the visual jazz opera, “The Occupy Mars Learning Adventures.” Contact: Suprschool@aol.com. Who wants to write music for Native American Flutes? We invite you to view our new photo essay including our chimes and Native American flute collection.